Heritage Vision Center: Designer Frames at an Optical Shop Near You! 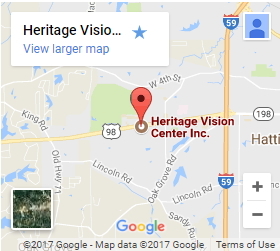 At Heritage Vision Center, we have provided Hattiesburg, Mississippi and the rest of the Pine Belt with quality designer eyewear, superior fashion and eye care services, second-to-none, since 1977! Heritage Vision Center is proud to have American Board of Opticianry Certified Opticians at our optical shop to assure you of the best quality services. We properly assist you in the selection of your eyewear the way a good server does in a fine restaurant, unlike some places that treat you like a fast-food customer. Heritage Vision Center keeps up to date with the latest technology and styles in lenses and frames, including lenses especially designed for use right where you are now – in front of a computer. We can easily be reached by phone at 601-264-1701, or come see us in person at our convenient Hattiesburg location, we are located at the traffic light in front of Sam’s Club. We treat our optical patients like family which has allowed us to be the oldest independent optical shop in the Pine Belt! As a general rule, any time you step outside, you should wear sunglasses to protect your eyes. However, there are certain times when this is particularly true. We'd like to help you narrow your search with a few designer brands (like these stunning Silhouette frames) that we are particularly fond of. We can take photos of you as well!